Last week, I listened to a podcast from one of my favorite authors, Andy Andrews. 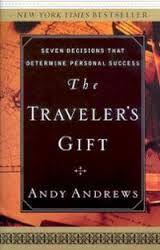 Andrews is the author of many motivational and self-help books, including The Traveler’s Gift and The Noticer. Personally, there is a soft spot in my heart for Andy as a communicator, because his Traveler’s book was the first I used to teach a Sunday morning class at my local church. From that point, there was no turning back for me; I’ve been an active teacher since reading that book. On this particular podcast, Andrews spoke of the organization of his office, the place where he works. What was important to his success? He speaks of the wall on the opposite side of the room, the wall he can see from his desk, any time he looks up. He calls this his ‘wall of influence,’ upon which he places reminders of those people, places and things which have had significant influence on his life. I’ve heard a comparable example before: What are your ‘legacy’ books, those you will never give away or lose? Many people have a special shelf on their bookcase for such books. Those books hold special meaning for some special reason. Andrews gives credit to several biographies he has read, and which have a place on his wall. He acknowledges the contributions and support of his family by placing photographs of them in strategic places on the shelf. I took time to ponder and ask the question: What’s on my wall? More importantly, are the items on my wall revealing – either to me, or about me? Truth be told, I am still working on my wall. After I heard the podcast, I started working on it, and I certainly have a few items on the shelf: pictures of family, parents, books I’ve read. We each have so many who came before us, who left a legacy to us and helped build our character. I am thankful to those in my life who instilled a sense of faith, and to those who, even today, continue encourage me to ask: Where is God in this situation? What I know is this: my wall of influence includes God in each item I select to place there. And for that, I am thankful. You are a very spiritual person, my compliment. I am reading The Noticer, now. And decided to start reading a lot of biografies after this book, I already put them on my to-read shelf….